When you hop in the shower to wash up for the day, the last thing you consider is the dangers potentially lurking in your product bottles. What could be so harmful about shampoo? It is a product meant to wash your hair, so it has to be healthy and clean. Unfortunately, many shampoo products contain parabens, which may prove harmful to you and your hair. To prevent you from falling victim to these chemicals, we've gathered all the information you need to decide on original or paraben free shampoo, as well as a list of the best paraben free shampoo on the market. What Are Parabens and Why Are They in Some Shampoos? Why Are Parabens Bad for Your Hair? The products and brands below are some of the best available paraben free shampoos on the market. Each one offers different benefits that might best suit what you want and need from a healthy shampoo for your hair. OGX Renewing Moroccan Argan Oil Shampoo is a paraben free shampoo that offers plenty of natural ingredients. The ingredients formulated to create the shampoo penetrate your hair to give it the softness, shine, and strength you desire. The thick, creamy formula lathers your hair and washes out easily without stripping your hair of natural oils. Overall, OGX Renewing Moroccan Argan Oil Shampoo is a good choice among some ​​​​of the best paraben free shampoos. The product comes in a large, salon size bottle to ensure you get the most out of your purchase. A little dollop goes a long way, which means the product lasts longer than standard shampoos. Why settle for a paraben free shampoo when you get to purchase the Art Natural Organic Moroccan Argan Oil Shampoo and Conditioner Set? You get both a shampoo and a conditioner that are free of parabens and sulfates. The shampoo and conditioner come infused with keratin to add strength and wellness to your hair. The addition of argan oil and other botanical extracts offers a natural shine while boosting the health of your scalp and hair follicles. If you are looking for shampoos that offer plenty of benefits for your hair, the Art Natural Organic Moroccan Argan Oil Shampoo and Conditioner Set might just be what you need. The set combines the power of a paraben free shampoo with a paraben free conditioner, too. You can rest easy knowing you are treating yourself and your hair to a salon-like experience with safe, natural ingredients. Herbal Essences is a popular brand of shampoo for many reasons. It smells great, leaves the hair feeling soft and fluffy, and now, you can purchase it free of parabens. The Herbal Essences Bio:renew White Grapefruit & Mosa Mint Naked Volume Shampoo is a great paraben free choice. The blend of white grapefruit and mosa mint leaves your hair feeling rejuvenated and fresh smelling. Make sure you test this shampoo on your hair and skin before using it as it may cause irritant for some. However, the majority of consumers agree that this paraben free shampoo gave them great results and left their hair feeling luscious and beautiful. Overall, it is worth trying, and the fact that you get two bottles of shampoo means you will have plenty to last you awhile. 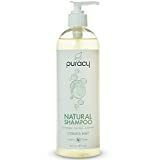 Puracy Natural Daily Shampoo uses a paraben free, third generation formula that leaves your hair feeling silky and smooth. The blend of ingredients will also help soothe your scalp as you massage the lather into your hair. The coconut-based formula cleans your hair without stripping it of natural oils. The blend of citrus and mint leave your hair smelling fresh and clean. Make sure you avoid this product if you are allergic to any of the natural ingredients. Otherwise, this paraben free shampoo is safe for use by everyone. The fact that it is non-toxic means you do not have to worry if it is accidentally ingested. 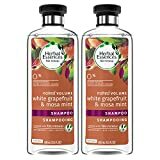 When you purchase this product, you receive two bottles rather than one, which means you will have plenty to keep your hair fresh, clean, and silky feeling. Part of what makes the DELUGE Moroccan Argan Oil Shampoo and Conditioner so great is that you get both the shampoo and the conditioner. A paraben free shampoo is great but add a paraben free conditioner to the mix, and you end up with an arsenal of hair protectant. The shampoo and conditioner are both free of additives that commonly damage hair and skin. Overall, the DELUGE Moroccan Argan Oil Shampoo and Conditioner is a great product pack. Rather than simply using a paraben free shampoo and then running the risk of using a conditioner with parabens, you get to use both paraben free products. Both the shampoo and the conditioner work together to ensure that you are using something that is safe and healthy for your hair. Parabens are a group of preservatives used in several products to prevent the growth of mold, mildew, and bacteria. You will often find parabens in cosmetic products and shampoo. According to Belgravia Centre, the FDA approves the use of parabens in shampoo because they extend the shelf life of shampoo products. Parabens ensure that shampoo and other products do not expire before their intended date. Your shampoo will not contain a lot of parabens. In fact, it might only contain between 0.15 and 0.3% of parabens by the weight of the product. However, even a small amount may prove harmful to your hair and skin when used daily. Additionally, parabens can be harmful to women's health. Parabens have been found to mimic estrogen. As such, prolonged exposure of this chemical to your skin can lead to distributions to your hormonal balance and in turn lead to breast cancer. ​Propylparaben is another paraben you might see among the ingredients, but the three mentioned above are the most common. Other harmful ingredients you should avoid aside from parabens include sulfates, such as sodium lauryl sulfate and sodium laureth sulfate. All-in-all, a combination of parabens and sulfates may lead to damaged hair and other unwanted effects. As discussed in the video, make sure you avoid products with silicones, parabens, sulfates, and petrolatum. The ingredients mentioned above can leave a residue on your hair that makes it impenetrable, which means your hair might not be as clean and healthy as you think. Each of the ingredients is aggressive and may have a damaging and drying effect on your skin and hair. It is important to understand what parabens do to your hair so you can best determine why they are best avoided. Shampoos containing both parabens and sulfates may strip your hair of necessary natural oils that act as a protective barrier. Without those necessary oils, your hair is prone to split ends and breakage. Also, parabens may cause you to have an allergic reaction when it comes into contact with your skin. Although you might think your skin has nothing to do with your hair, an allergic reaction that occurs on your scalp could make it hard for you to manage your hair. As the shampoo runs down your body and comes into contact with the skin on the rest of your body, you run the risk of an allergic reaction. Unfortunately, parabens may also share a link with increased estrogen in the body. In fact, parabens are a synthetic estrogen. Although the number of parabens in shampoos are rather minimal, it is still a concern as it may lead to breast cancer. Studies show that parabens and breast cancer may share a link because of increased exposure to synthetic estrogens. Increased estrogen and synthetic estrogen in the body cause cells to divide, which in turn leads to cancer. A study performed on a breast tumor found trace amounts of parabens within the cancerous breast tissue, thus raising some concerns about the use of parabens. Not to mention that sulfates and parabens may destroy your hair follicles rather than replenish and rejuvenate them. Look for paraben free shampoo that contains a list of natural ingredients rather than chemical-based ones. For instance, try to find shampoos that have organic, raw, or even plant-based ingredients. Many companies produce all-natural shampoos that do not contain chemicals and preservatives. They even avoid heat processing and unnecessary additives that are harmful to your hair and skin. ​​​​​These nasty chemicals aren't only used to preserve your shampoos. A lot of skin care (and makeup) products contain them as well. It does not matter what amount is listed on the product. The truth about parabens is they're harmful to our bodies. The skin is a barrier between your organs and the outside world. When you apply these harmful ingredients to your skin, they seep through and affect all that goes on inside your body. However, this doesn't mean you need to ditch your skin care regime and avoid makeup or other common toiletries (lotion, shampoo, deodorant). There are brands who aim to be a healthier alternative and avoid using parabens in their products. Your health is important to us which is why we did the research for you! Use an apple cider vinegar pre-wash: Apply apple cider vinegar to your hair before you wash it. Let it sit for approximately five minutes before you wash your hair. The apple cider vinegar breaks through harsh residues, which allows your shampoo to wash your hair properly. Avoid brushing your hair while it is wet: Brushing your hair while it is wet may cause the hair to break. Instead, wait for it to dry before brushing through it. Also, start from the tips and work your way up. Gently brush the hair rather than tugging your way through tangles. Use cold water for conditioner and rinsing: When you add conditioner to your hair, use cold water, and make sure you rinse with cold water, too. Cold water helps lock the moisturizers from your conditioner into your hair, so it works better. Look for products with coconut oil: Coconut oil is a great moisturizer for your hair. Either you should use products containing coconut oil or simply apply a small amount of coconut oil to the ends of your hair to avoid split ends and achieve a shiny, healthy, non-greasy look. Most importantly, now that you know the truth about parabens, make sure you use a paraben free shampoo. No matter the tips you follow, if you continue to use a paraben free shampoo, it may damage your hair anyway (and cause health problems down the road). Paraben free shampoos will give you the best results for a healthier head of hair and lifestyle.